We are slowly starting to make progress on both the front and backyard – I actually have to give a big shout out to my husband who has been tackling the HUGE job of re-mulching our yard one weekend at a time. We live on a corner lot so in addition to our own plant beds and fence, we take care of the embankment along the road so as you can see above that is no easy feat! While we’re mostly concentrating on the backyard this year, I did make one small but mighty improvement to the front – I built this super cute and functional hose holder out of some scrap wood, a wood finial, and a metal hose holder that I found at Home Depot and spray painted black (check on Shanty 2 Chic for my inspiration). Our hose bib is in the garage, but the hose was starting to spend most of it’s summer sunbathing in the driveway, driving me crazy! Now it has a place to rest that is easily accessible to both myself and the boys when we water the plants in the front, and I actually think it is a pretty cute addition to the front porch. Now – onto the backyard. If you’ve been following along you’ll remember that we switched gears from working on the fire pit this year to working on the patio and solving the biggest issue we have….the BLAZING sun! Our solution was to add a cantilever umbrella (thanks mom and dad for the anniversary present!) that can provide shade to the little table and chairs during the afternoon, but can be tilted on an angle and block the sun as it starts to set right at the time we would eat dinner at the patio table. I am so happy to tell you guys that it is TOTALLY WORKING!! We actually get a really nice breeze here in Hilltown, so even on a super hot day just blocking the sun out turns the patio from unbearable to incredibly pleasant. I’ve got a few more projects I’m hoping to knock out before the winter and hopefully I’ll have some more to share with you in my next round up! Inside the house I’m slowly on a mission to change the feel of a few things on the first floor from the style that I thought I wanted when we first moved in, to the style the house has ended up becoming. 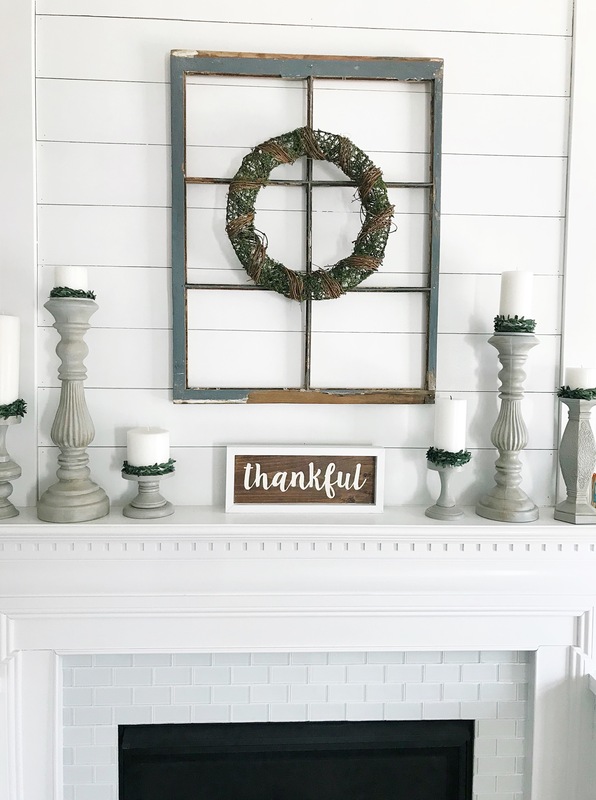 I’ll elaborate more on that in some upcoming posts, but one of my favorite ways to quickly and inexpensively change up decor is to use chalk paint. I love keeping my eye open for clearance ceramics and pottery, especially large pieces!, that maybe aren’t the color that I want but have great design. Last month I scored this big pink vase from Target for $8!!! and just painted it with a few coats of Martha Stewart Chalk Paint in Eucalyptus. I think it’s such a fresh color for the spring/summer and it looks great with all of the white and wood tones in the living room. Another way I love to use this stuff is to connect a group of disparate objects by painting them the same color – case in point, the candlesticks on my mantel. If you’re familiar with my living room you know I’ve had a group of gray candlesticks up there for a while, all of which I painted with Krylon Chalk Spray Paint in Misty Gray and finished with a dark wax to age them a bit. Well I decided to change things up and I made another set. They started out as a group of really cheap finds from the clearance sections of Michaels and Homegoods as well as the Goodwill – all different colors and materials. With a few coats of Rust-oleum Chalk Spray Paint in charcoal they all give me that variety of shape and size that I want, but with a unified color. SIDE NOTE – I actually decided not to go with these for my current mantel, but I am keeping them for the fall and definitely for Halloween! We are continuing to cook our way through the Magnolia Cookbook and this month we tried two recipes that will definitely become weeknight staples in our house! The peppered bacon at the bottom of the Baked Chicken is soooooooo good, and I’ve been trying for a while find an easy Mexican rice recipe to make when we have tacos and this one is my new fav. for sure.